“FINANSCONSULT” EOOD, a Bulgarian company filed a word trademark application (number 225917) for the word “Torro” for cigarettes and cigars and products for smokers in class 34. Red Bull Gmbh opposed the mark. Red bull Gmbh have a trademark number 214184 for TORO ROSSO and another mark (number 214185) for TORO ROJO, for non-alcoholic beverages including refreshing drinks, energy drinks, whey beverages, isotonic, hypertonic and hypotonic drinks (for use and/or as required by athletes); beer, malt beer, wheat beer, porter, ale, stout and lager; non-alcoholic malt beverages; mineral water and aerated waters; fruit drinks and fruit juices; syrups, essences and other preparations for making beverages as well as effervescent (sherbet) tablets and effervescent powders for drinks and non-alcoholic cocktails; all included in class 32. Scuderia Toro Rosso, commonly known as Toro Rosso or by its abbreviation STR, is an Italian Formula One racing team. It is a Formula 1 team owned by Austrian beverage company Red Bull. Toro Rojo means Red Bull and was a Marvel Character. Red Bull argued that its marks were well-known. Toro Rosso is a well-known mark for Formula 1 racing and is applied to cigarette lighters among other goods. Since cigarette lighters are associated with cigarettes, there was a likelihood of confusion. Ms Jaqueline Bracha accepted this argument, relating among other decisions, to the Virgin Candles ruling (here) and ruled that there was a likelihood of confusion. To put it crudely, this decision is a load of bull. Red Bull is well-known in Israel. The other marks owned by the company are less well-known. Red Bull has, through an aggressive trademark campaign, liquidated most competitors using images of bulls on drinks. Red Bulls and their graphic logo is one thing. The distinctive color scheme of Red Bull is another. 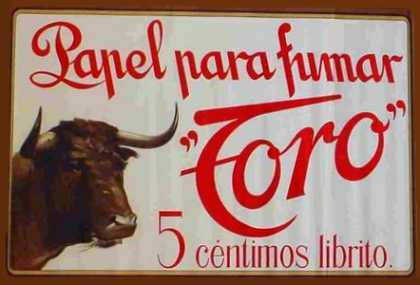 I don’t think that the company deserve a monopoly for all uses of bulls in all languages, and can’t see why they should be able to stop a Bulgarian company selling Torro cigarettes. I think the Virgin candles decision was wrong as well. Virgin Enterprises gets involved in all sorts of things, from airplane travel to music to mobile phones. I don’t see candles as similar to their lines of business, but arguably the font used was reminiscent, although the candles, made from coagulated olive oil, were called virgin as the term is an adjective widely applied to olive oil. Red Bull makes drinks. Drink s and cigarettes are different. Torro looks and sounds different from Red Bull as well. It the Deputy Commissioner had applied the five strands of the triple test, she might have noted that the marks sound different, look different and are used for different goods. And I thought my own cybermusings were esoteric.